Today on a very special MARATHON LIVE STREAM of Kotaku Splitscreen, Kirk and I will be playing video games for 12 hours. Here’s the catch: they’ll all be video games that we picked for one another—games we’ve never played before. 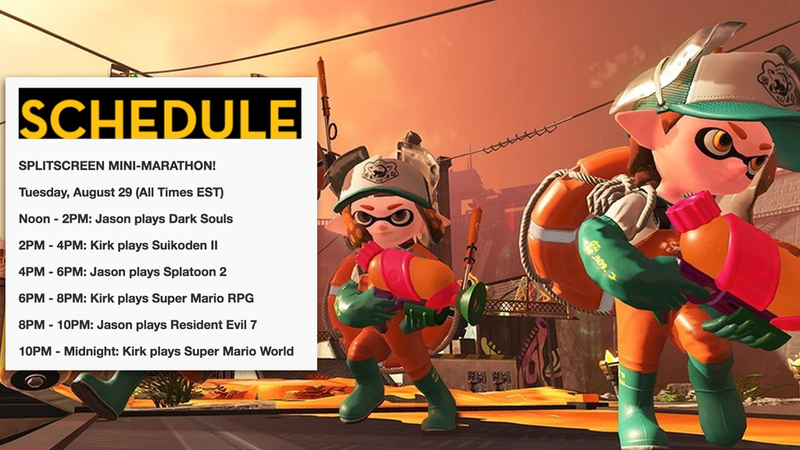 From Splatoon to Suikoden, this will be a packed day full of us playing video games we’ve never played before, so come join the fun and hang out with the Splitscreen crew on this fine Tuesday in Portland. You can watch it all here, or directly on Twitch at the Kotaku channel starting at 12pm Eastern.